Poet Jenny Benjamin's new books! November 28th, 2017: Chapbook Contest Results! I received many wonderful manuscripts for the first (and hopefully annual) No Chair Press Chapbook Contest. I am very pleased to announce my two choices for publication. Elise Hempel grew up in suburban Chicago and has worked as an editor, proofreader, copywriter and university English instructor. Her poems have appeared in numerous journals, including Poetry, Measure, Valparaiso Poetry Review, The Evansville Review, Southern Poetry Review, and The Midwest Quarterly, as well as in Poetry Daily and Ted Kooser's weekly column, American Life in Poetry. She is the recipient of an Illinois Arts Council Literary Award and the winner of the 2015 Able Muse Write Prize in Poetry and the 2016 String Poet Prize and has been a finalist or semi-finalist for several book awards. Her first chapbook, Only Child, was published by Finishing Line Press in 2014, and in 2016 Able Muse Press published her first full-length collection of poems, Second Rain. She lives in central Illinois. Jenny Benjamin is the owner of her freelance writing business JB Communications, LLC. Over thirty of her poems have appeared in journals, including DIAGRAM, South Carolina Review, Fulcrum, Baltimore Review, Chelsea, and Crab Orchard Review. Her first novel, This Most Amazing, was published in 2013 by Armida Books in Nicosia, Cyprus. Her poetry chapbook, More Than a Box of Crayons, is forthcoming from Finishing Line Press. She lives in Milwaukee, Wisconsin with her three daughters and dog. Please join me in congratulating these poets. Both chapbooks are scheduled for publication in April 2018. No Chair Press’s next open reading period (not a contest) will be in April 2018. Submission guidelines for that open reading period will be posted on nochairpress.com by February 2018. Entries now closed for No Chair Press's first chapbook contest! Thanks to everyone who entered the first No Chair Press chapbook contest. I received a lot of lovely entries and I'm grateful. The winners will be announced on December 1. The chapbooks themselves will appear in print in March or April 2018. Our next reading period will be the month of April 2018. I'll won't be holding a contest with a cash prize, but will be selecting one chapbook manuscript for publication by No Chair Press. Announcing No Chair Press's Second Book!!! No Chair Press is proud to announce the publication of the word b-i-r-d by Elisabeth Meyer! Work continues on No Chair Press's second book! A sneak preview of our next book, the word b-i-r-d! 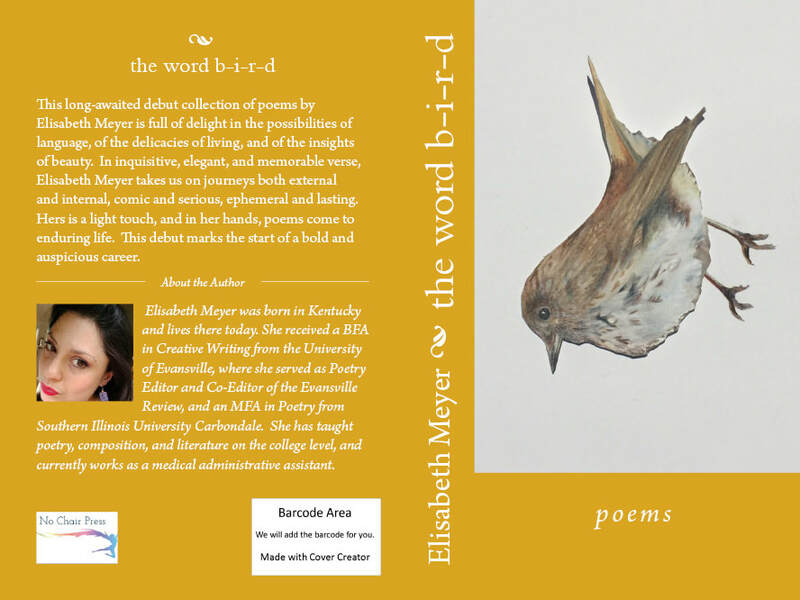 The lovely collection of poems is by poet and educator Elisabeth Meyer! We're almost at the proof stage, and are projecting publication for the end of September! Guidelines for our first contest! For this contest, No Chair Press is seeking manuscripts of rhymed and metered verse, given a contemporary spin by today’s women poets. The majority of the poems in submitted manuscripts should be engaging formal techniques. Sonnet sequences very welcome, as are rhymed verse plays. A manuscript entirely of free verse poems is not a good fit for this particular contest and press, but a few free verse poems in an manuscript that predominately has formal poems (sonnets, villanelles, rondeaus, etc) will not eliminate that manuscript. 4. There is a $5.00 reading fee ($10 if you wish to receive a copy of a No Chair Press book). Pay entry fee at https://www.paypal.me/NoChairPress. Email a copy of your receipt to nochairpress@gmail.com to confirm payment of entry fee. 5. Results of the contest will be posted at No Chair Press’s website at the end of December 2017. 6. Book publication will occur in April 2018. Announcing the arrival of No Chair Press!! No Chair Press will concentrate on publishing poetry chapbooks written in traditional rhyme and meter by contemporary women poets. As editor, I'm looking for a strong use of rhyme and meter and I'm particularly happy to see sonnet collections, villanelle sequences, and use for traditional French forms such as the rondeau. If you write free verse, this is not the press for you to submit to--(while I love and appreciate free verse and write a lot of it myself)--No Chair Press will have a particular focus on chapbooks of formal, metered verse. Watch this site for guidelines to submit a manuscript during our October 2017 reading period! We'll have a call for manuscripts on this site, as well as through CRWROPPS, the Creative Writers Opportunities List, which I curate. Our second book has been commissioned by Allison Joseph! I am happy to announce No Chair Press's second book, a chapbook by Elisabeth Meyer entitled "The Word B-I-R-D." Lis and I are working on bringing out this bright and beautiful collection by October 2017, right when our first chapbook contest opens. I've known Lis since she was my student at SIU, and when I thought about a second chapbook to personify what I want No Chair Press to represent, I thought of Lis's lucid and beautiful poems. Watch this website for more on Lis's book!